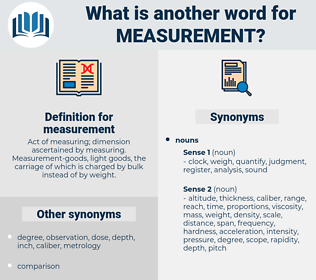 What is another word for measurement? Act of measuring; dimension ascertained by measuring. 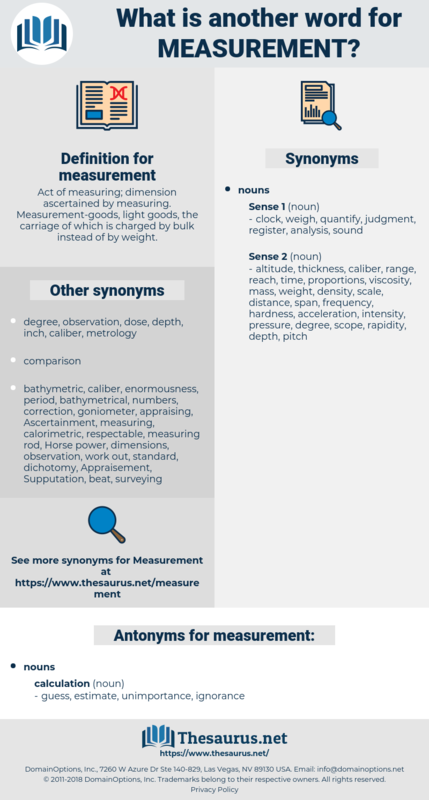 Measurement- goods, light goods, the carriage of which is charged by bulk instead of by weight. countermeasures, arrangements, Recommendations, tools, safeguards, Undertakings, surveyors, objectives, implications, Incentives, approaches, tips, options, flags, measured, metrology. Standards, constraints, monitors, ratios, probes, valuations, increases, evaluators, moves, dimensions, Anomalies, proportions, pointers, limits, depths, Capabilities, senses, Abilities, assesses, Possibilities, Grips, flags. data, measurability, measured, yardstick, measurable, metrology, barometer, quantization, quantifying, step, restraint, method, analogy, titration, benchmark. identified, proposed, Enabled, recognised, Weighed, Met, intended, agreed, required, saw, recommended, needed, recognized. representing, implementing, existing, Preventing, Granting, Relating, Outlining, Addressing, Responding, helping, grappling, controlling, logging, dealing, acting, Doing, quantifying. Gauged, Prevented, empowered, Enabled, impaired, Persuaded, absorbed, poised, positioned, qualified, Allowed, suited, placed. understands, captures, stands, Tracks, enables, recognises, results, depends, improves, underscores, appreciates, monitors, weighs, reflects, is, Remedies, grows, needs, leads, plans, allows, Forms, recognizes, moves, puts, acts, Does, assesses, approaches. The prisoner walked to and fro in his cell, counting its measurement, and the roar of the city arose like muffled drums with a wild swell of voices added to them. I don't know whether he is cleverer or less clever; there is no scale of measurement between you: but he is wholly void of ambition, and might possibly assist yours. mikir-meithei, muck around, monochromat, mess around, major mode, miscreant, macaroni wheat, migrant, monkey around, mockernut. gravimetry, Spirometry, hydrometry, foetometry, algometry, anemography, pelvimetry, quantitative chemical analysis, reading, anemometry, Seismography, quantitative analysis, arterial blood gases, hypsometry, telemetry, meter reading, anthropometry, bathymetry, sampling, sounding, plumbing, dosimetry, audiometry, Cephalometry, thermometry, Photometry, viscometry, hypsography, surveying, quantification, Tonometry, calorimetry, thermogravimetry, mental measurement, densitometry, observation, sound ranging, viscosimetry, radioactive dating, fetometry, angulation, actinometry, Micrometry, scaling.